"Never Start a Marketing Campaign Without a Dedicated Landing Page". 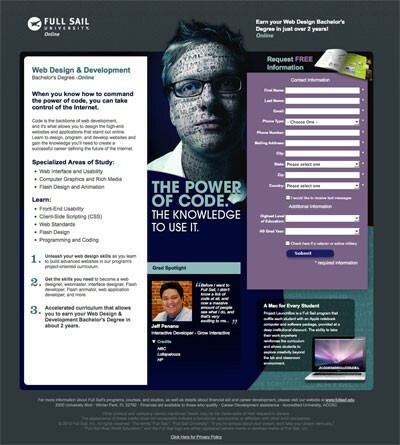 A dedicated landing page is essential for the success of all of your marketing campaigns. Whether it’s email marketing, pay-per-click ads, SEO, content marketing, social media marketing or something else. Why is a landing page so critical for online marketing? Landing pages help you convert visitors into leads. They use a conversion form to do that and by keeping the message strong and reducing distractions. They are well optimized to convert your visitors into leads. Landing pages help you measure performance of your marketing campaigns. By tracking and analyzing the metrics associated with the landing page, you can easily measure the performance of your marketing campaign. Landing pages help you collect valuable information about your prospects. When your prospects convert and submit the conversion form, you get valuable insights and demographic data about them. This can help you understand what kind of prospects are converting. This will help you determine your audience and whom you should target to in the future. This means that you need a standalone, DEDICATED landing page for every marketing campaign that you start. If you are running several pay-per-click ads with different ad copies and ad messages, you need separate landing pages for each of them. These dedicated landing pages will be the ‘places’ where you will direct your traffic from your marketing campaigns. But why do you need separate landing pages for each of your campaigns? Why can’t you use one generic landing page for all of your marketing campaigns? This is something even savvy marketers struggle with. One reason why this principle is so important is because of message match. Studies have shown that landing pages that match the message and the ad copy from which they were linked to are more effective in converting leads than landing pages that are generic and are not ad-specific. To elaborate this, let’s take a look at this hypothetical scenario. A woman is looking for a painter to paint her home. She does an online search and comes across an advertisement of a local painting service. The ad copy says “Get Free Consultation”. She thinks it’s a good idea to get free consultation – hence, she clicks. If the landing page where she is directed talks specifically and clearly about giving free consultation, she is highly likely to submit her contact information to have someone call her. On the other hand, if the landing page is generic and not ad-specific and if the copy of the page is not focused on giving free consultation, she is likely to look elsewhere and unlikely to fill in the conversion form, even if it offers her something of value like a discount on booking. Here is a visual example of good message match. Since message match reduces the bounce rate and increases the rate of conversion, it’s recommended to have separate and dedicated landing pages for each of your marketing campaigns. Hence, The More The Better. However, according to Marketing Sherpa’s Landing Page Handbook, 62% of B2B companies that use landing pages have six or fewer total pages. So, why do landing pages remain so underutilized? The main reason is that the marketing department of these businesses either don’t know how to set them up or they are too overloaded. Luckily, there are many marketing software solutions to this problem. A landing page service lets you build an effective landing page in minutes without any IT knowledge and coding. So, you don’t have to wait for days for your webmaster or IT resource to build it for you. With a marketing software solution that includes landing page service, you can set them up yourself in no time. Hence, with a good landing page service at your hands, you can build as many landing pages as you require and get as many opportunities to convert your visitors into leads.